With our Friday Night Ate back at 3/4 strength (Tom and Barb still in the Bahamas), we made the “long” (maybe 2 tenths of a mile) journey to Pelican Restaurant in Washington Township (Turnersville) NJ. Formerly, the Pelican Fish Company Restaurant, they may have dropped the “Fish” part of their name but they are still serving lots of great fish, to the point where it might be considered sinful to order something other than fish at this establishment. Being a Friday in Lent, none of us had qualms about choosing the fish offerings. 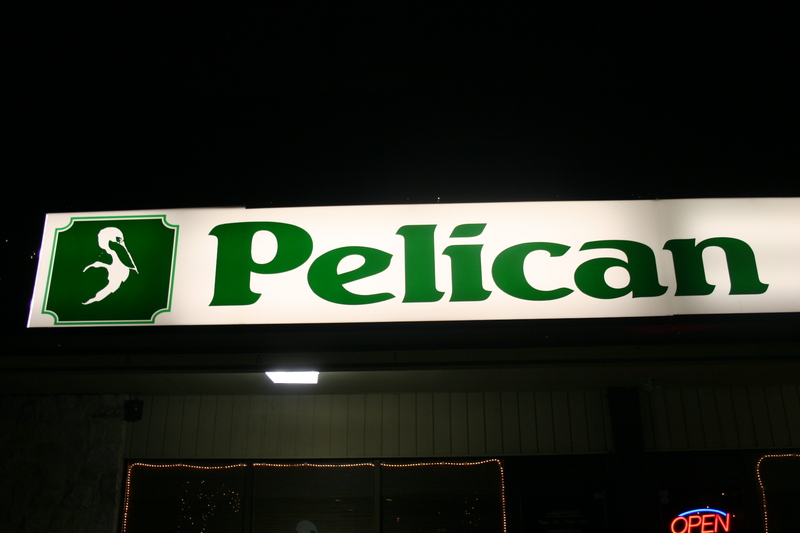 The Pelican recently was reviewed by Philadelphia Inquirer Food Critic, Criag LeBan, and the favorable review must have caught the eye of many of the locals because when we arrived for our 7:30 reservation there were 20 people milling about the entrance waiting for tables in a packed house. We were seated against the wall and Jerry proceeded to beat our server to the punch and open our wines (Jerry is usually prepared for any eventuality). I immediately proceeded to pour a glass for my wife and I, directly into our water glass! My only excuse for this amateurish behavior was that I was dying for a glass and unable to wait two more minutes for the wine glasses to arrive, OR……I foolishly believed the water glasses WERE our wine glasses. You decide! 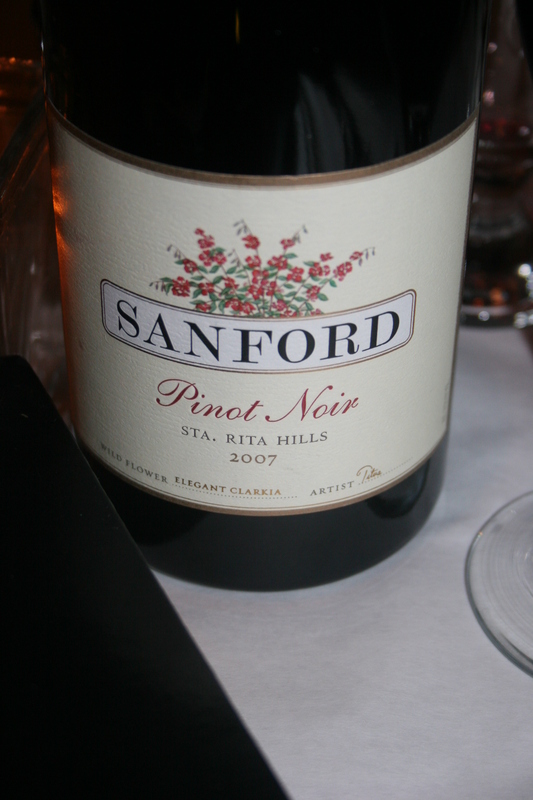 My wine for the evening was the 2007 Sanford Pinot Noir, Santa Rita Hills. I knew we would be having fish and I felt this would go well with so many different seafood options. The wine was a little darker in color than most Pinots lots of strawberry flavor on the nose. The texture was smooth with cherry and plum notes and little evidence of the 14.5% alcohol content. Jerry and Joe both had Argentinian Malbecs. Joe’s was from one of our favorites, the 2008 La Posta, Pizzella Family Vineyards, Malbec. Jerry’s was the 2008 Aqua di Piedra, Gran Reserva, Malbec. I found an interesting review on Jerry’s Malbec on a site called The Wine Guild of Charlottesville (VA). 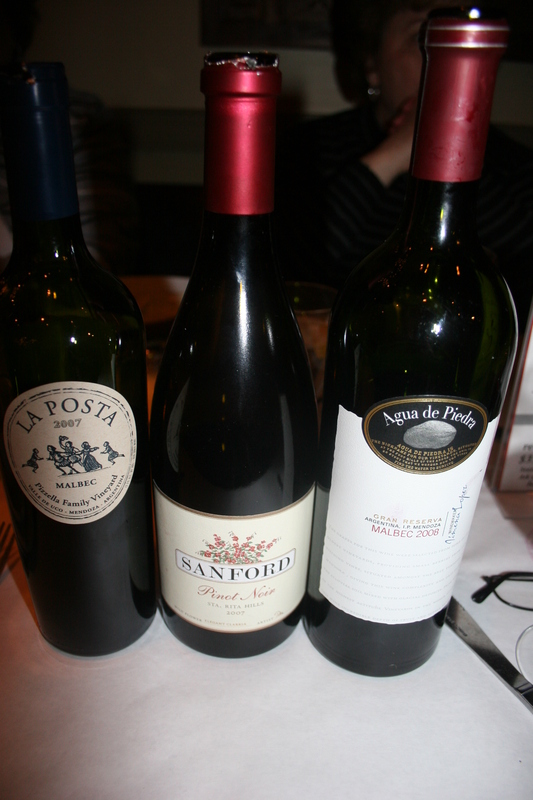 The basic topic of the piece was how Malbec is becoming too contrived, much like Aussie Shiraz. The author found one that was not like most others. Meanwhile, back at the table, Carol and Kathy had decided to split an appetizer . They chose the Hot Crab Dip $12.00. Spinach, artichoke, lump crab meat, cheese, served with crostini. I had actually had my eye on this to split with someone myself. Kathy and Carol enjoyed it while I chose a cup of the Drunken Seafood Bisque, filled with blue claw crab meat $5.95, as did Jerry. We both thought the soup was served at a nice temperature and had good flavor and enough pieces of seafood. I did have a large piece of something that I never could get to manageable size to consume but it did not ruin the soup. We all had a salad which accompanied each meal, simple house salads with a vinaigrette dressing. I was torn between the Scottish Salmon and the Baked Crab Imperial. When our server informed me they were out of the salmon, my choice was made. 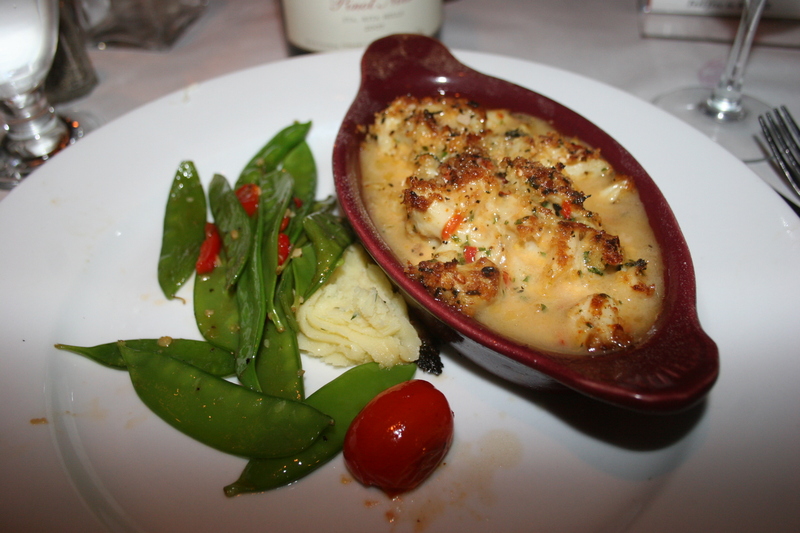 The dish was perfectly done, nice and hot, generous portions of crab in a tasty sauce, the snow peas were excellent and the dollop of potatoes so good that I found myself slightly upset that there wasn’t more. In my mind, right now, I am trying to come up with a word that is smaller than a “dollop”. They weren’t far from being described as “scent of potatoes”. Had they not been so good I wouldn’t be belaboring their absence. 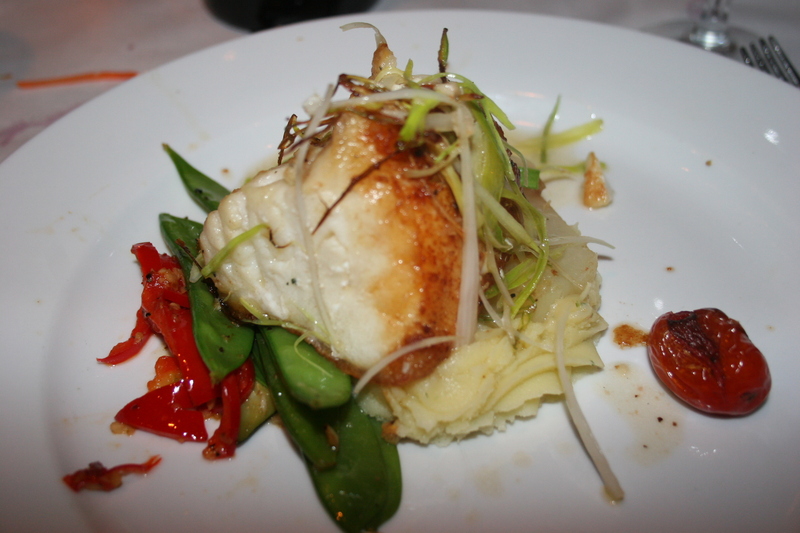 Joe and Sue selected the Pan Seared Chilean Sea Bass with Leeks, served over spinach and potatoes. I believe they substituted the snow peas for the spinach and as I am looking at the picture of Joe’s Sea Bass I am now wondering why he has so much more potatoes than I did. Hey, what’s goin on here?? 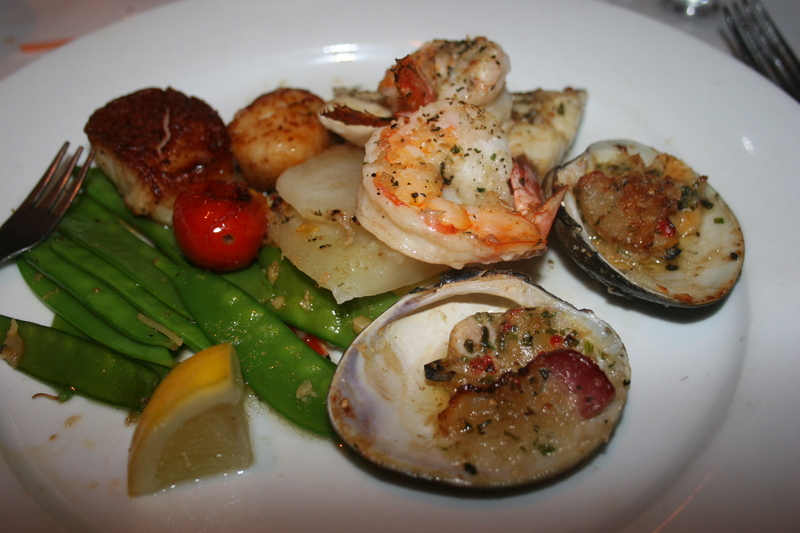 Jerry went with the Broiled Seafood Combination, shrimp, scallops, clams casino and a four ounce fish du jour, accompanied with drawn butter and lemon. He also had the snow peas and as I look closer, no potatoes, which puts me just barely ahead of him in the “potatoes game”. Jerry enjoyed the dish but, and this is just my own opinion, not his, he would have liked a heartier portion. In fact, I’m thinking he went home and made himself a light snack. Kathy was the only one who ordered from the “Specials” menu. 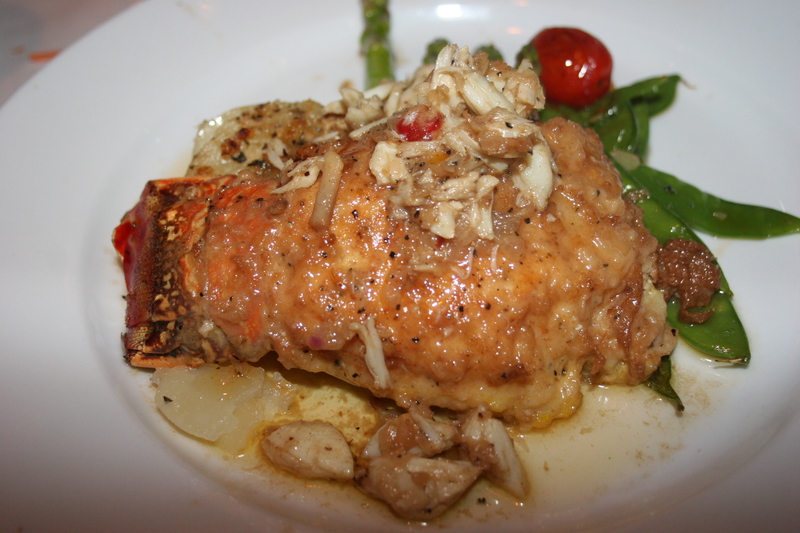 The had Bronzino and a Baked Lobster Tail with crab imperial and asparagus. She had the lobster. It was delicious. She just told me now, and this adds to my dismay, that it was resting on a bed of yummy potatoes. I may scream. 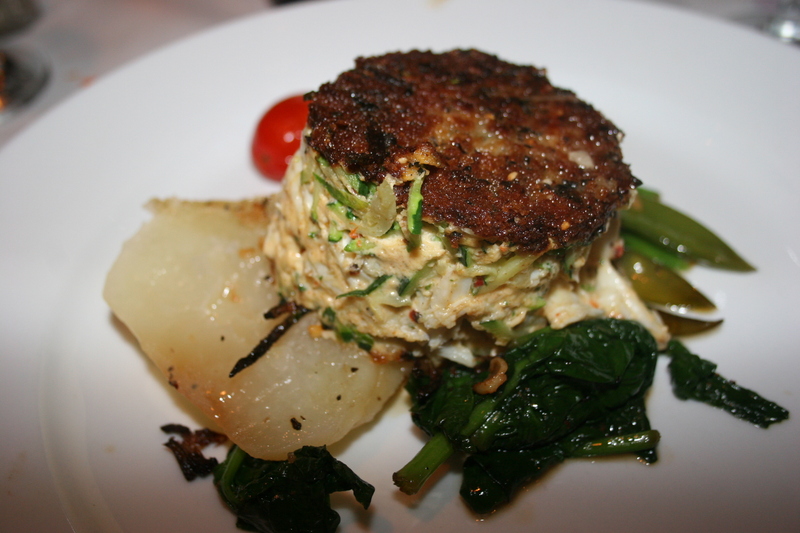 Last, but not least, Carol had the Zucchini Crab Cake, jumbo lump crab meat between crispy julienne zucchini and panko breadcrumb layers. I heard her use the word “delicious” more than once while eating. It seems that everyone was quite pleased with their choice. The bill for the meal $75.00 per couple with 20% gratuity pre-billed for party of six or more. Not a bad price for a meal of this caliber. If you go, make sure you have reservations and try and stay away from Friday nights during Lent.